In a shot in the arm for the Bharatiya Janata Party and Shiromani Akali Dal ahead of Punjab assembly polls, their alliance on Tuesday defeated Congress in the Chandigarh municipal corporation election in which demonetisation had emerged as a key issue. 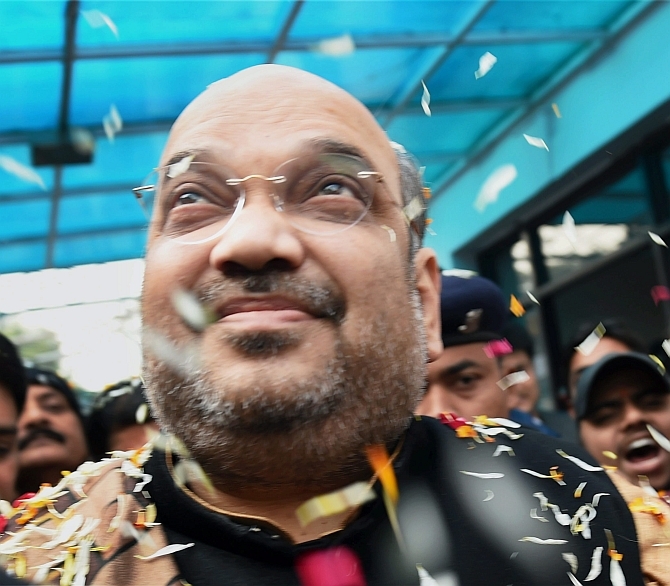 The BJP won in 20 wards out of 26, its ally SAD bagged one, four wards fell in the kitty of Congress and one ward was won by an Independent in the elections held on Sunday, an election office spokesman said. Congress had majority in the Municipal Corporation after the previous three elections. However, in the mayoral election in January this year, the BJP candidate had won. Tuesday's result is the biggest ever victory for any single political party in the body since its inception in 1996. "After banning of high-value currency, we are repeatedly winning -- first in byelections in five states, after that Thane municipal polls, Rajasthan polls, Gujarat polls and today the people of Chandigarh have accepted the BJP wholeheartedly," he said. Chandigarh BJP MP Kirron Kher said that the voters endorsed the Narendra Modi government's demonetisation drive as it was against corruption besides other pro-people steps taken for overall development. "All schemes launched by the PM are implemented in Chandigarh at ground level," she said. Kher said that the results of civic polls will have an impact on upcoming Assembly polls in Punjab, which shares Chandigarh Union Territory as its capital with neighbouring Haryana, Uttrakhand and Uttar Pardesh. Accepting defeat, former Congress MP Pawan Kumar Bansal said that demonetisation was an issue in the polls. He said that the party will sit and find out reasons for its performance. Prominent winners included sitting BJP Mayour Arun Sood, former MP Harmohan Dhawan's wife Sunita Dhawan (BJP), Devinder Singh Babla (Cong), Gurbaksh Rawat (Cong), Davesh Mudgal (BJP) and Shakti Singh Devsali (BJP). Those defeated included BJP youth leader Saurabh Joshi, former Mayor Subash Chawala (Cong) and Chandigarh Congress President Pradeep Chabbra's wife Ritu Chabbra. Independent Dalip Sharma won from ward 19 while SAD's nominee Hardeep Singh romped home from ward number 10. Eight women contestants, including Raj Bala Malik, Farmila, Chandrawat Shukla, Hira Negi, Asha Kumari Jaswal (all from BJP) and Gurbaksh Rawat, Ravinder Kaur and Sheela Devi (all from Cong) won comfortably from their wards. The overall polling percentage in the Chandigarh Municipal Corporation election held on December 18 was 59.54 per cent. Election to 26 wards of the Municipal Corporation was seen as a litmus test for BJP and Congress post demonetisation. Total 122 candidates, including 67 Independents, contested the polls. The total number of voters were 5,07,627, including 2,37,374 women voters.